Public Service Announcement: There are only two ways you can vote in the presidential election. One: You can go to your local polling place and vote IRL. Or two: You can vote by mail, with an absentee ballot. You cannot vote via text message, despite what a new wave of Twitter memes might lead you to believe. 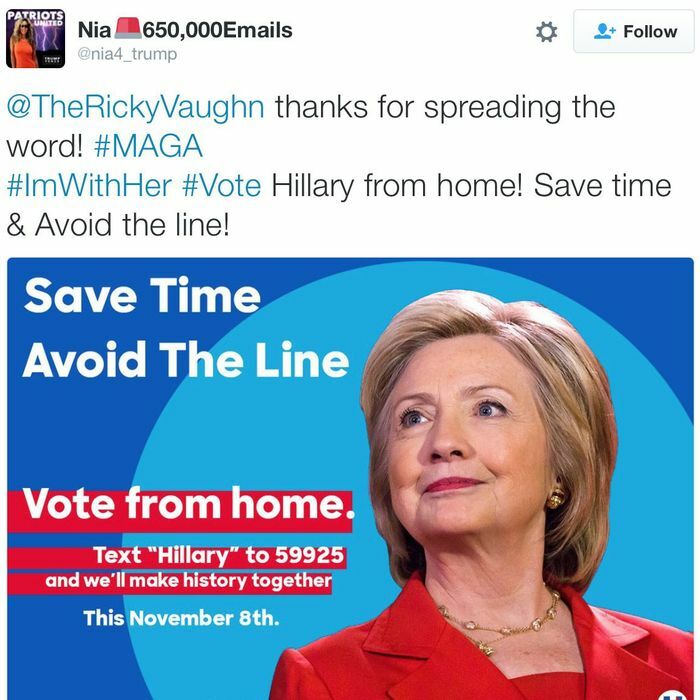 Perhaps more frightening than the fact that someone out there is trying to trick eligible voters into throwing away their votes is that this behavior is allowed under Twitter’s terms of service. Twitter user Robert McNees tweeted a screenshot of an email he received after reporting the memes to the company, notifying him that Twitter would not be intervening. It’s a tricky area for Twitter. Fake content gets shared all the time on the platform without anybody raising an eyebrow. (Anybody who has ever Photoshopped a joke will tell you this.) But in this case, does Twitter have a civic responsibility, given that the purpose of these jokes (if you want to call them that) is to disenfranchise people? Especially given that the company has been actively involved in encouraging people, on both sides of the aisle, to get out there and vote next week. Select All — which is going to punt on this particular question — has reached out to Twitter and will update this post if we hear back. In the meantime, save your data and don’t text that fake number. Instead, shoot a quick message to a friend and remind them to hit the polls with you on Tuesday. It’ll be much more effective for your candidate. Update 11/2/16 3:45 PM: The original tweets containing the memes have been deleted. Still no word from Twitter.